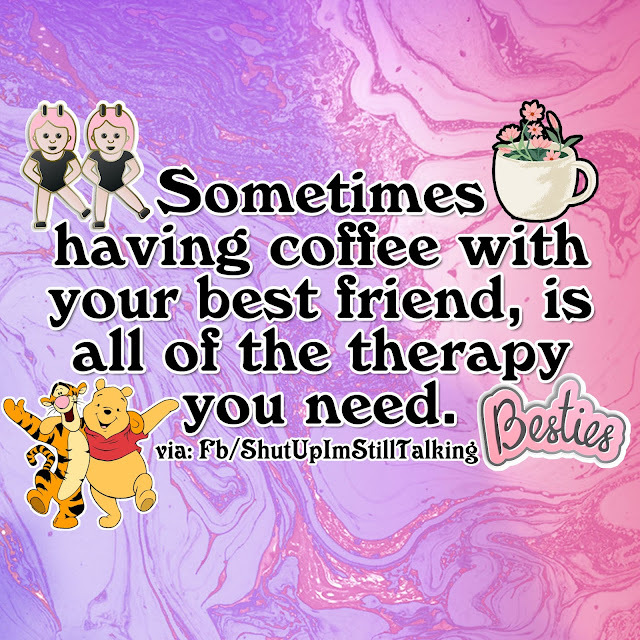 Sometimes having coffee with your best friend, is all of the therapy you need. This is the truth. Coffee or even a walk with a friend relieves stress and anxiety. You share your good and bad and realize you aren't alone. The hard part for some of us is having a friend that would want to have coffee with us. Coffee is one of the few things you can ask to get together over. Morning coffee is special especially with your best fried. I always enjoy my best when visit. Therapy is best way to enhance once personality. Coffee drinker are most wiser. It is definitely the best form of therapy. Best Form Of Therapy picture/image is an Inspirational Stuff to Inspire and Motivate You. You can download pics by just clicking on the Images. Thanks for visiting Truth Follower an online place for huge collection of inspiring pictures, quotation, and Sayings Images. If you like Best Form Of Therapy, Please Share with friends and family on Facebook, Twitter, and Pinterest.